Bengaluru: Singapore’s sovereign wealth fund GIC Pte. Ltd and private equity firm Blackstone Group Lp have emerged as the two top global investors in India’s real estate sector after almost a decade of investing in the country. Canada’s Brookfield Asset Management Inc. is fast moving into the big league. GIC and Blackstone, which have different investment strategies and return expectations, have bought some of the best projects across real estate assets classes—residential, office space, hotels and shopping malls—since 2006. New York-based Blackstone has invested about $2.7 billion in real estate projects in India across 19 transactions and manages the largest portfolio of office parks in India. GIC has invested around $2 billion in building a diversified portfolio. On Wednesday, DLF Ltd, India’s largest developer, said it is in exclusive talks with GIC, formerly known as Government of Singapore Investment Corp., to sell the 40% stake of its promoters in a rental unit. The stake sale is expected to raise about Rs12,000-13,000 crore. Both GIC and Blackstone were earlier shortlisted for the stake-sale transaction. Once the GIC-DLF deal goes through, it will be GIC’s largest office investment in India and will put it in a formidable position, challenging Blackstone’s top slot. Blackstone opened its real estate division in India in 2007 but started buying office assets only in 2011, when not many investors were interested in the prime rental asset class. “Both GIC and Blackstone didn’t slow down investments even when the markets turned slow. As a sovereign, GIC has been investing quietly in a variety of asset classes and it is in no hurry. Blackstone has focused more on core, rental assets and followed a specific strategy to buy them," said Shobhit Agarwal, managing director, capital markets, and international director at property consultant JLL India. GIC and Blackstone didn’t respond to queries. 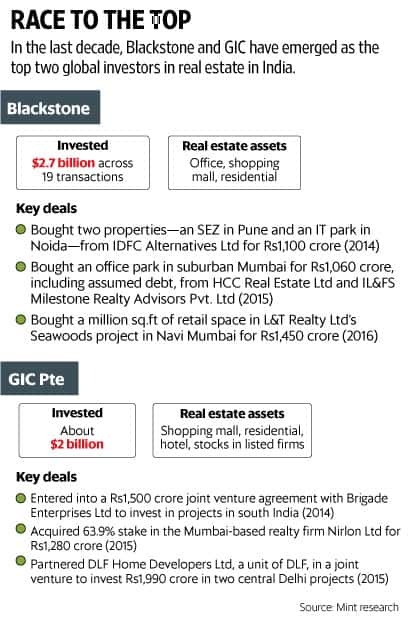 Both GIC and Blackstone have been active investors in Indian real estate with very different strategies and investment horizons. As a sovereign fund, GIC’s investment horizon is longer, which means it can stay invested on a long-term basis, giving it an edge over Blackstone. GIC bought a 50% stake in R City mall in suburban Ghatkopar, in Mumbai, for close to Rs300 crore back in 2006 in what was its first real estate investment in the country. Blackstone signed its first transaction in 2008, when it bought a minority stake in management firm Synergy Property Development Services Pvt. Ltd.
Blackstone owns 31 million sq. ft across 16 operating office parks and an additional 11 million sq. ft under development. Meanwhile, Brookfield has built a $2 billion asset base in India in a span of seven years and last year, started investing in residential projects from its new $9 billion global real estate fund. “Brookfield’s strategy is a little different from the others because it has a more hands-on, operational focus where it wants a control position and typically manages the assets it buys," a person familiar with the investor’s plans said on condition of anonymity.